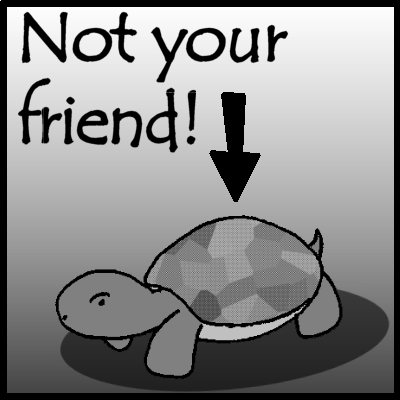 You may think that Turtles are your friends. You may think that they aren’t trying to take over the world. You may also think that this comic details their plot and gives insight into their terrible conspiracy. written by Jonathan Harvey and drawn by Joleene Naylor, it all starts with a meteor, and from there on The Terrible Turtle Conspiracy follows the interconnected story of a world threatened by turtles… well, sort of. Scratch that. The Terrible Turtle Conspiracy tells the tale of woe that…. No, no. Try again. The Terrible Turtle Conspiracy is a silly comic that is full of zany characters doing outrageous things. It will make you laugh, guaranteed, or your money back. What do you mean you’re not paying? Well then, you have nothing to complain about, do you?